What franchises do you want the Sonic franchises to have a crossover with? I'm confused here, do you mean crossovers that actually happened, or theoretical ones? Uhh...When did Sonic ever crossover with those two? I'm with James in that I'm confused what you mean. If you mean literal crossovers, ...well, besides SSB, Mario and Sonic, and that Sega All-Star Racing game, I don't think there are any. As a Spyro fan, I can pretty much guarantee Sonic was NEVER in a game with them. ...No, I am not counting Skylanders, because I see Spyro as a guest star of Skylanders, nothing more. I can almost guarantee Sonic was never in a Transformers thing in any medium. ...Or do you mean that those two were in SSB...Because Spyro and Transformers was never in any Super Smash Bros. If you mean theoretical "fantasy" crossovers that you wish would happen with Sonic, then you probably should change the title to "What franchise do you want the Sonic Franchise to have a crossover with?" hmm... I guess something like Klonoa would be interesting? I mean Klonoa is already pretty much like a Mobian though he does not really talk like them. That would still be quite interesting.. Or think TMNT and Sonic xD how cool would that be? 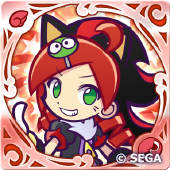 But I want a crossover with Puyo Puyo since they're both Sonic Team based. LocationThe city sits where Putin. But isn't Kremlin. MIB. Seriosly, MIB - beautiful replacement for GUN. Cause you can cross Dr Who with almost anything and it'd work! And for it to be the 11th Doc at the end of his run, just to see his reaction when introduced to 'Amy Rose'! Other anthromorphic animal series: Doraemon Movies, Solatorobo, Klonoa, Rocket Knight, Star Fox, etc. They got Super Robot Wars and Super Heroine Chronicle, Make them a Super Animal Legend or something. Bwa? Er... Those games really don't suit the tone of Sonic.... okay, Half Life... Maaaaaaaaybe, but the rest are too grim and gritty. You'd end up with another Shadow the Hedgehog but worse in terms of tone. Personally... I don't feel you can make a crossover with anything. Well, you can, but NOT if you want to keep the spirit of the works. There are two things you need to balance. 1) Power Levels. You have to make sure that the two sides are of similar power levels, otherwise it's not fair on the weaker franchise as the other will dominate. Note, this applies more to heroes than villains, as long as everyone in the crossover and contribute equally. 2) Tone. You have to make sure the tone matches between the two. And this is were I think the idea with Call of Duty say fails. It is a (or sorta was) realistic military shooter with LOTS of deaths. Sonic is a cartoon animal superhero franchise with few deaths. Either Call of Duty gets its claws trimmed, OR the Sonic world sees so much bloodshed it's left so warped it's not Sonic anymore. Well... at least you didn't suggest crossing it over with Warhammer 40k. *shudders* Anyone suggesting that deserves a chainsword up the rear. Okay, ignoring the 'Sonic doesn't need a gun' argument. Laser or not, it's still a gun. Something used to kill people. If it's just Shadow using it, that's fine, he's the anti-hero. If it's against robots, that's fine, cause robots. The way you're speaking, you're perfectly happy to have Tails or Cream armed with a lethal weapons shooting at living people. I hope I'm interpreting this wrong. That solves the Power Level problem. But not the problem that Call of Duty and Sonic are so different in tone. Actually, I'd argue that Sonic is the more power side in the above example. What is the onscreen death toll in an average Call of Duty Game? What is the onscreen death toll in an average Sonic Game? This is the trouble. They are so different in tone that one (or both) has to be warped so much that it is no longer what it was originally. You've taken it's soul away. I wouldn't want to see Cream with gun. She only needs one weapon...the Chao Missile aka Cheese.